We are exploring different forms of intra- and inter-home audio communication. Though much technology exists to support this human-human communication, none of them make effective use of the context of the communication partners. We aim to augment a domestic environment with knowledge of the location and activities of its occupants. The Family Intercom provides a test bed to explore how this context supports a variety of lightweight communication opportunities between collocated and remote family members. It is particularly important that context about the status of the callee be communicated to the caller, so that the appropriate social protocol for continuing a conversation can be performed by the caller. Nagel, Kris, Cory D. Kidd, Thomas O'Connell, Anind Dey, & Gregory D. Abowd. 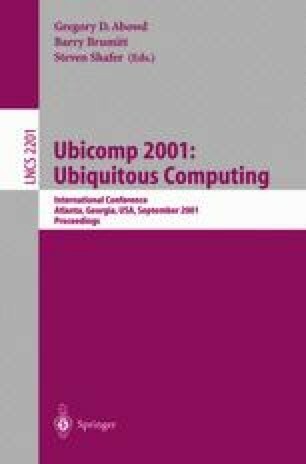 (2001) The Family Intercom: Developing a Context-Aware Audio Communication System. Georgia Institute of Technology GVU Center Technical Report GIT-GVU-01-04. http://www.cc.gatech.edu/gvu/reports/2001/index.html-01-04.